Prashanth Shenoy has been appointed as CFO of NMC in August 2017. He joined NMC in 2016 and has served as the Deputy CFO, directing Corporate Strategy and Mergers & Acquisitions department. He played an instrumental role in NMC’s acquisition of Al Zahra Hospital Sharjah, a Class 1 transaction on the London Stock Exchange. Shenoy has also been spearheading fund raising and equity placing activities for the group. He has been closely involved with NMC’s strategic entry into the healthcare market in the Kingdom of Saudi Arabia. Shenoy brings with him 18 years of experience across various industries, predominantly in pharmaceuticals and healthcare. 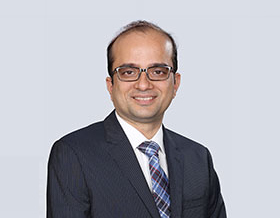 Prior to joining NMC, he has played a key role in the finance functions at global healthcare organizations such as Allergan and Biocon. He has well rounded experience in corporate finance, managing business collaborations / overseas subsidiaries, treasury, foreign exchange risk management, business strategy, preparing business plans and evaluation of investment opportunities. Shenoy is a qualified Chartered Accountant.